Jan 10, 2018-Political leaders, social activists and students have called for the immediate release of Dr Govinda KC, who was arrested on contempt of court charge on Monday. 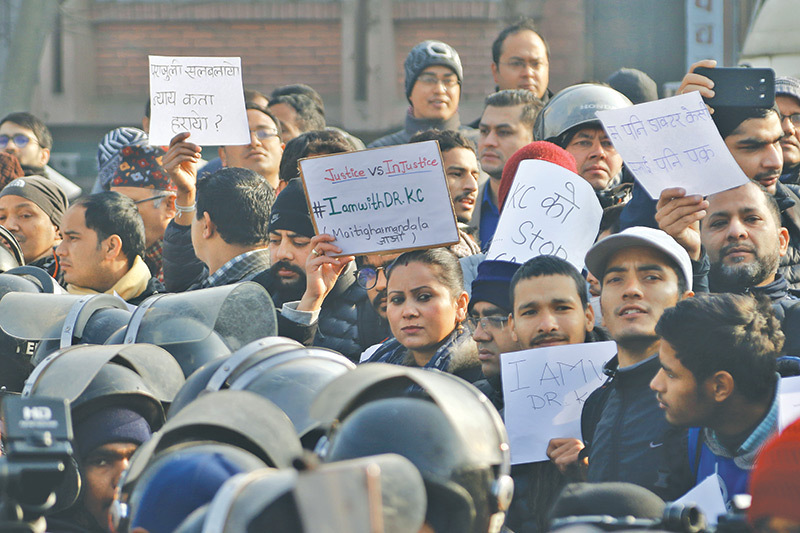 The supporters of Dr KC said that the Supreme Court should be independent and free of all biases, and that a civilian should be allowed to express his or her voice against wrong judgments passed down by a court. Hundreds of people assembled at Maitighar Mandala in the Capital on Tuesday to express their solidarity with Dr KC. Present among them were former prime minister and the coordinator of Naya Shakti Party-Nepal, Baburam Bhattarai; former health minister and Nepali Congress leader, Gagan Thapa; coordinator of Bibeksheel Sajha Party, Rabindra Mishra; and singer and activist, Amrit Gurung. Addressing the assembly, Thapa challenged the authorities to arrest all people present at the gathering if the issue raised by Dr KC can really be construed as contempt of court. “We respect the court as it has been the centre of hope in every major development that occurred in the country. But it should not take decisions at the cost of losing people’s faith in the judiciary. This protest is not intended to smear anyone or any institution. Instead, it is aimed at making the country’s judiciary more respectful,” said Thapa. Mishra condemned the unexpected overnight arrest of Dr KC, whom he described as an “exceptional individual”. “KC’s arrest is condemnable. The commitment he has shown to the point of sacrificing his own life for the betterment of the people is exceptional,” said Mishra. A large number of security personnel were deployed in and around the SC premises, just a few hundreds metres away from Maitighar. 1. It’s a fact known to all that Chief Justice Gopal Parajuli got his citizenship from two places. It is a crime; immoral and illegal for a person to get more than one citizenships. This is why he [Parajuli] should be investigated and punished. 2. He not only received citizenship certificates from two places but even altered his age. He has been holding the post of chief justice based on the second citizenship he received from Kathmandu district. But he also attained an age of 65 in Ashad, 2074 (June-July 2017). Let the issue be investigated. It is against the law to occupy the post of chief justice after getting 65 [the retirement age]. These sorts of activity are tantamount to “trading of justice”. 3. Not only was it on a wrong legal basis that Gopal Parajuli gave a clean chit to Lokman Singh Karki, but his relative (nephew) was also appointed as an advisor to the Commission for Investigation of Abuse of Authority after Karki’s exoneration. The activities of acquitting someone in return for favour of job for one’s relatives show that the judicial prestige and faith in justice have been bought and sold. Let there be a fair investigation into this issue and truth be brought to light. Parajuli should be punished for abusing his authority. 4. There is controversy over whether Gopal Parajuli has passed the SLC. On this issue, the document and order issued by former chief justice Sushila Karki should be linked. The academic certificates of CJ Parajuli should be probed. How can a person hold the post of chief justice without having the academic certificate necessary for a judge? Isn’t this a crime of putting the state and the court in the dark? 5. As questions have been raised in the media about his academic degrees and qualification, let the court ask for and look into the original document and decisions made by the Judicial Council and the Constitutional Council in this regard. 6. Doesn’t Parajuli’s biased (ex parte) order in favour of land-mafia in the case of Jagdish Acharya that overturned the government’s decision and policy introduced to systematise and regulate the land-plotting business show “justice sold”? 7. Parajuli’s verdict that exempted hotels from paying royalties for operating casinos has led to the “death of justice”. The country has lost revenue. How can a person “killing justice” be expected to maintain judicial independence? 8. Various verdicts issued after Gopal Parajuli took the helm of Supreme Court including on the cases of Chudamani Sharma, Gopal Khadka and Ncell have promoted the corrupt and created a situation whereby Ncell was relieved of tax dues worth Rs60 billion. Don’t these activities make a mockery of the rule of law? There should be judicial review of verdicts on the aforementioned cases. 9. The move to promote his relative (Parajuili’s nephew-in-law) within a span of 6-7 months to the post of registrar, chief registrar, and High Court chief judge has sabotaged judicial independence. A person involved in influencing his relative’s promotion for three times within 6-7 months doesn’t have the moral ground to hold the honourable post of chief justice. That’s why, as an informed citizen, I have demanded his resignation. And I believe that he [Parajuli] should step down. Otherwise the person will continue to obstruct the process of the judiciary becoming independent and free. 10. On the very night of an impeachment motion registered against then-chief justice Sushila Karki, Parajuli assumed the post of chief justice at 10:30. Which law and norm allow this? A person involved in illegal activities can’t maintain the dignity of judiciary. Therefore, his resignation is fully justified. 11. The Kantipur daily has been acquitted in a contempt of court case filed against it for publishing an article titled “Where there is Gopal Parajuli there are cases of medical college”. That means the news carried by the Kantipur daily was judicially proven. The verdicts and orders issued by Gopal Parajuli in the cases prove the same. Hence, it doesn’t suit a person whose character has been exposed judicially to remain in the honourable post of chief justice. As CJ Gopal Parajuli has been challenging the faith, dignity and independence of judiciary, and is guilty of contempt of court, I request the judiciary to take action him in a contempt of court case. The accusations against me are baseless. I ask the bench of all the SC justices except Parajuli to conduct a hearing on this case.